This is something I would never have realized without having a houseblog that allowed me to easily look back on my bold predictions, but I believe that I have just solved one of the great puzzles of remodeling. We all know when we think a particular project will be completed, but how can we predict when it will really be done? Today I put the 2nd coat of stain on the door of our family room closet. That got me to thinking about how long it had been since I had started sanding the door. A quick search on our site revealed the answer…1 year, 11 months. Ironically, I titled that post ‘back in the saddle,’ which implied that we were back on the horse for a ride, not just a quick trot around the yard. Sadly, the door sanding post came a good six months after the room was allegedly nearly done. And not to mention that in the meantime some animal(s) had holed up under the tarp for enough time to do unspeakable things to that door. 7/2008: I will give us a pass here, since Ginger was born a year earlier, but we now finally start the project. 10/2008: We are nearly finished after only 9 weeks. We are on a ROLL here! 5/2009: That’s strange…where did the last 7 months go? Anyway, it doesn’t matter, because the door is being sanded, and we are going to be done soon. 5/2010: Now would be a good time to get the patio cleared off for the summer. Ooh, wait a minutes, what’s this crap under the tarp?! Damn it, this never would have happened if I had just finished sanding this door when I stopped a few weeks (a full year) ago! 4/2011: Last week I did actually finish sanding the door (as well as the upstairs bathroom door), and I stained it this weekend. Things are really moving now! The end result will be the number of months it will take to finish the project. The amazing thing I have discovered, though, is that no matter what project you plug into the equation, the end result is always virtually the same…somewhere between 3 and 4 years. This doesn’t apply to the entire house remodel, mind you, as that will never be done, but it is a good estimator of how long a single component of the remodel will take. I hope that others will find this equation useful and stop themselves before they even start projects. Or better yet, before they purchase their home. If you stopped telling yourselves that this “little” project will only take a few weeks, you could save a lot of headaches and cash. Try this out before embarking on your next job and see if it still makes sense! And if anyone finds this to be useful or discovers missing factors, please let me know in the comments. And since we are actually getting close to finishing this family room, let’s get back to the closet door. 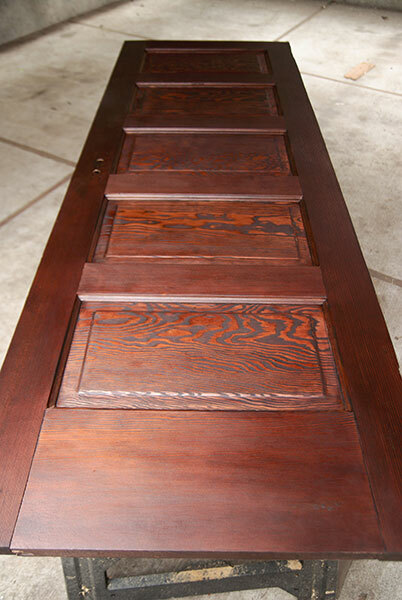 As with all our old fir doors, it looks fantastic with fresh stain, most importantly, there is no visible trace of it having been used as a toilet. This kind of gets me motivated to start working on the rest of the upstairs doors. How long could that take? I am SOOOOOO in the same boat! I love how your door turned out. I have one that is similar that has a half dozen different colors of paint on it. Any suggestion of product to use to aid with the refinishing? Thanks so much. I love following your site. 2)Our speedheater (https://bungalowinsanity.com/2008/09/23/97-layers-of-paint-on-the-wall/) works great, but they are spendy. Also, I only have good luck on big flat surfaces, and I’m never happy with it for detail work. 3) Otherwise, I use a gel stripper. The trick I figured out a couple of years ago was to use some steel wool after getting the bulk of the paint off. A scraper or blade works great for taking off the thick stuff, but it always took many more applications of stripper to get the remainder. I tried using steel wool one day, and it worked great for getting the last little bit. It grabs all the fine paint and the residue that tends to stick in the paint. Once the paint/gel has gummed up the pad, you have to toss it. With all methods, I am careful to never do any dry sanding or scraping, because I don’t want to create any lead dust. Why didn’t you save us sooner? We now have at least a dozen such “little projects” going. Why did we start new ones when the old ones weren’t done yet? I have no idea. Must be a form of mental illness. Thanks so much for your blog. Its an inspiration and a comfort to us! My version of home remodeling is to just plod along, one project at a time, and not jump right from one to the next. My next thing will probably be the doors, but I want to experiment with rehabbing a window this summer, too, just to see how long it takes. I figure I’ll pick one I can’t get open anyway, so if it stays the same, no harm done. Previous Previous post: Happy birthday, house.